When rough tartar accumulates on tooth surfaces and touches the gum line, it is time for a professional oral assessment, treatment, and prevention visit. An examination by your veterinarian is the first step. Your veterinarian will confirm that a dental cleaning is needed and will review with you what procedures are likely required prior to the dental cleaning. Since it can be difficult to predict the extent of dental disease in advance of the procedure, it is imperative that your veterinarian be able to reach you during the procedure to discuss any additional treatment that may be necessary. Your veterinarian may perform preanesthetic blood tests to ensure that kidney and liver function are satisfactory for anesthesia , as well as an evaluation of the heart and abdomen if needed. What happens during a professional teeth cleaning visit? 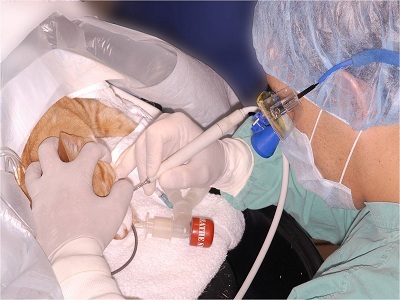 For proper dental evaluation and care, your pet must be safely placed under general anesthesia. Anesthesia allows the veterinarian to thoroughly examine the mouth, noting any abnormalities in your pet's medical record. How are my pet’s teeth cleaned? After the mouth is evaluated and diseased teeth noted on your pet’s medical chart, tooth scaling will be performed, using both hand and ultrasonic scalers, to remove tartar above and below the gum line. The tartar below the gum line causes the most significant periodontal disease, so its removal is important. If periodontal disease is advanced, it may not be possible to save badly affected teeth. These teeth will need to be extracted. After scaling, the teeth are polished to decrease the rate of subsequent plaque build-up. Why can't tartar and plaque be removed with a human dental scaler? Only the visible tartar is removed. This leaves plaque and tartar below the gum line which will continue to cause periodontal problems. It is neither possible nor safe to clean the inner surfaces of the teeth properly in a conscious pet. The use of any instrument on the tooth enamel will cause microscopic scratches on the surface which will ultimately damage the tooth surface, leading to further disease - this is the reason your dental hygienist always polishes your teeth after removing tartar with dental instruments. Yes. Your veterinarian will perform preanesthetic tests and examine your pet for underlying disorders prior to the procedure, and may determine that antibiotic treatment should be prescribed in advance. Plaque and tartar begin forming in as little as six hours after your pet’s dental cleaning. A home dental care program is a must. Plaque and tartar accumulation can be decreased by rubbing a Q-tip along the gum line daily. Absolutely not. Human dentifrice or toothpaste should never be used in pets. Human teeth cleaning detergents contain ingredients that are not intended to be swallowed and can cause stomach problems in animals. You should also avoid using baking soda to clean your pet’s teeth. Baking soda has a high alkaline content and, if swallowed, it can upset the acid balance in the stomach and digestive tract. In addition, baking soda does not taste good, which may cause your pet to be uncooperative when you try to brush their teeth. Pet toothpastes are considered safe to be swallowed and are available in flavors that are appealing to pets including poultry, beef, malt, and mint. If you use a product that tastes good, your pet will be more likely to enjoy the whole experience. In addition to the pleasant taste, many of these pet-friendly toothpastes contain enzymes that are designed to help break down plaque chemically, which reduces the time you need to actually spend brushing your pet’s teeth.